Hi everyone! I hope you are all having a great Thursday! 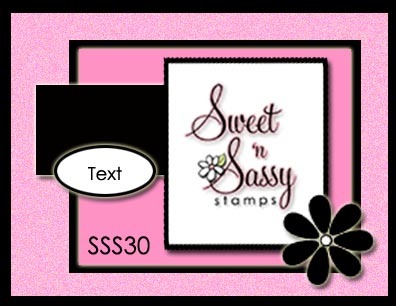 The card I have to share with you this morning uses this cute digi image from Whimsie Doodles. It is called "Peas On Earth" and is available for free for members of the Paper Craft Planet Group. So if your not already a member of this group head on over to PCP and join. There are some really great incentives for being part of the group. This card is for 2 challenges. Creatalicious Challenges ~ Make something for Christmas & Include snowflakes and lots of sparkle/glitter. To create the snowflakes on my card I used 2 different snowflake punches. One from EK Success and the other from Martha Stewart. 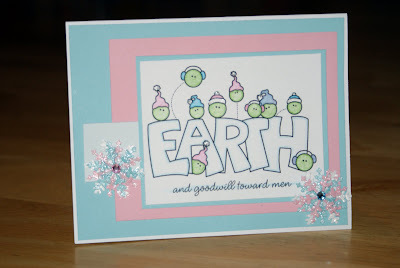 For each snowflake I punched 1 out of each color, white(MS), pink & blue (EK Success). Then stacked them on top of each other so that they are not completely overlapping each other. Then I added glitter to the finished snowflake. There is a slight difference in the two snowflakes. The difference being that pink is the top color in one and blue is the top color in the other. I finished out the snowflakes by adding either a pink or a blue gem to the center of the snowflake. The blue was added to the snowflake with the pink on top and the pink was added to the one with the blue on top. It's hard to tell in this picture but I colored blue around the inside edge of the word EARTH. Even though you can't see it in the picture you are able to see it quite well on the card itself. The original image did not have the "and goodwill toward men" on it. I added it to it for this card. Supplies: "Peas On Earth" -Whimsie Doodle Stamps, Martha Stewart Snowflake Punch, EK Success Snowflake Punch, Frosted Lace Stickles, Nicole Rhinestones -Pink & Blue, Cardstock - White, Lt. Blue, Pink & Pale Blue, Colored Pencils. I LOVE the image of Peas on Earth and you colored it beautifully! Thanks so much for playing along with us at Creatilicious....hope to see you at next month's challenge too. oh my! SUPER cute and adorable!!! OMGoodness your card is absolutely adorable! I love the non-traditional colours! And the sentiment underneath! Beautiful,love the colours and your fabulous sentiment!!! thanks for joining us at Creatalicious.